When will State Parks Approve and Fund the 15 Highest Priority Bike Turnouts? (Ref: 48/68 Bike Turnouts Identified in 2017, NO Bike Turnouts Approved or Funded in 2018 or 2019, Letter - 15 Highest Priority Bike Turnout Locations dated 11/28/18. 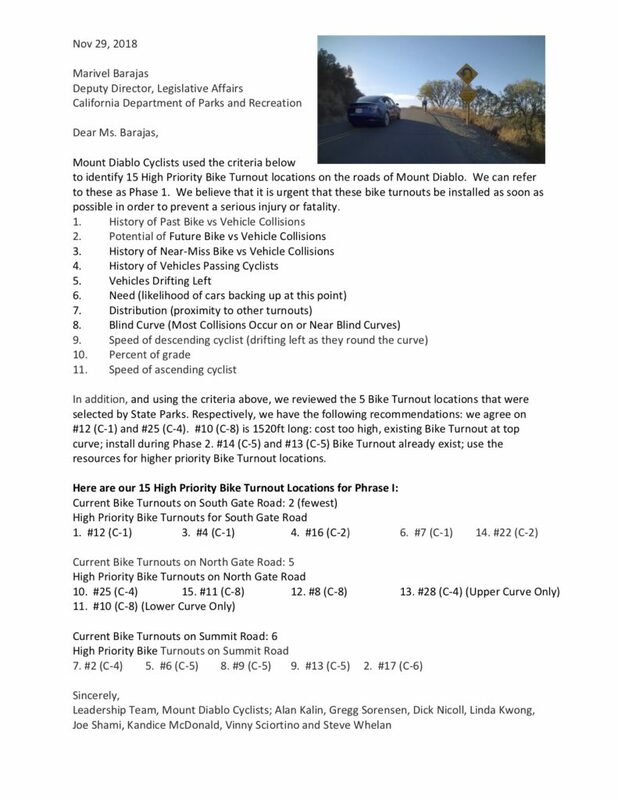 Bike Turnouts are supported by elected leaders, Mount Diablo State Park Staff and volunteers, the California Highway Patrol, Bike East Bay and other cycling organizations, and a petition with over 3,300 signatures. Surveys from motorists and cyclists alike, and video images all support the potential of Bike Turnouts to significantly reduce collisions, injuries, and possibly fatalities. We believe that the ultimate goal of preventing a Bike vs Vehicle Collision, and the potentially fatal consequences thereof, more than justifies the investment.